During our Christopher Robin press trip we also spent a little time learning about the Marvel Avengers Infinity War Blu-ray and DVD release from Executive Producer Trinh Tran. The presentation was held at Madame Tussauds Hollywood which allowed us time to experience the Marvels Superheroes exhibit and also make our own Infinity Gauntlet. My family and I visited Madame Tussauds in San Francisco a few years ago, so I had an idea of what to expect at Madame Tussauds Hollywood. With 7 Madame Tussauds locations around the US and more around the world, it’s no surprise millions of people have visited Madame Tussauds over the past 200 years! Each museum caters to its location as well as features famous people from all over the world. So it came as no surprise that Madame Tussauds Hollywood featured lots of famous actors and movies scenes, celebrating the glamour and excitement of this filmmaking mecca. 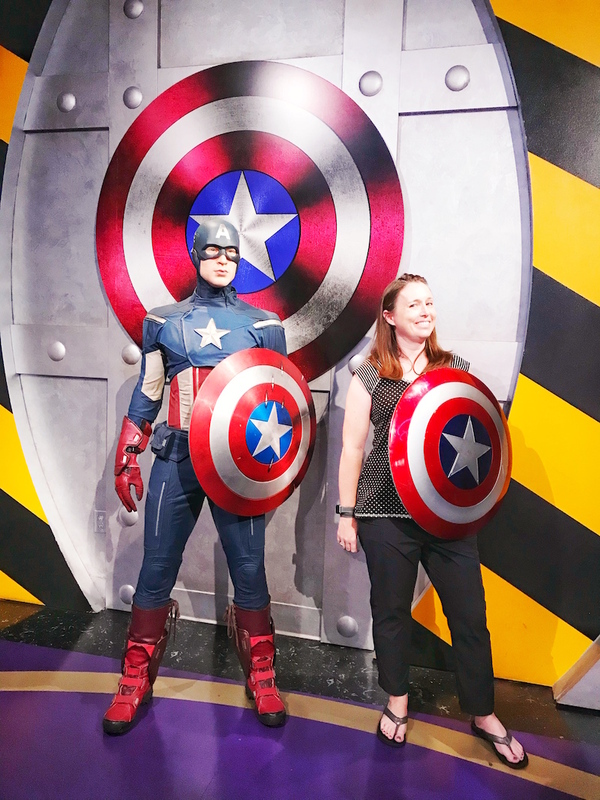 You will find a variety of Marvel superheroes on display at Madame Tussauds Hollywood. Tony Stark, Captain America, Thor, Nick Fury, Iron Man and Wolverine are all located together in the special Marvels Superheroes exhibit. You’ll find a fun Spiderman scene located in another section of the museum. There is also a Marvel Super Heroes 4D film adventure as well. While we were at Madame Tussauds Hollywood, we had the opportunity to make our own Infinity Gauntlet. The process was fairly simple but you are exposed to extremely cold water and fairly warm wax during the process. We could do pretty much any hand pose we liked, so I chose a ‘hang loose’ sign. Don’t you think that if Thanos has just relaxed and chilled out, maybe he could have skipped the whole killing 1/2 the universe part of his storyline? Unfortunately, making an Infinity Gauntlet is not something normally offered but you can do a regular wax hand for $15 and add colors for $2 each. The purpose of our visit to Madame Tussauds Hollywood was to chat with the Executive Producer of Marvel Avengers Infinity War, Trinh Tran. Here are a few fun things she shared with us about filming Avengers: Infinity War. How did you decide who survived? It was pretty difficult. Sitting in the story meeting we really had to make the decision of yes, who we want to survive so that we could tell the next story. We sat there and we boarded out, we brainstormed, we’d sat in the room, we hash it out every single day. It was really trying to figure out how this was going to connect to Avengers 4. We wanted to be able to tell a story. I won’t get into it much because, I don’t want to spoil anything, but there is a specific reason why some of these people survive. Is there a character that you really wanted to survive? You know, I had the same reaction the first time I watched Peter Parker and it was pretty hard, pretty emotional to see him go through it especially him being so young and he’s Tony’s protégé. You know, Tony taught him certain things and I was pretty heartbroken when we decided that he had to go. Which Avenger would you want to be? You know what? I know Captain Marvel is not Infinity War but she’s the one. I’m looking forward to her movie and I think it’s about time. It’s only because she’s so strong and what’s so important is that she embodies leadership and we got to have more of that. Especially Female (leadership) so I’m looking forward to March when this movie comes out. What’s it like having all that star power on one film? I think the first time when I saw them all in their costumes, walking together the first time, seeing the different characters from the different franchises come together, it’s pretty incredible just to see them. Thor and Peter Quill in one shot just talking to each other. I can’t believe that this is finally happening. The star power, when they’re all coming together and they’re all in one scene. I think the crew just goes silent, this is happening. We’re actually making this. It’s pretty powerful. I have to be honest. Everybody is so friendly and nice to work with and there really isn’t a Diva. I do know that when Mackie comes on set, nothing ever gets done because he’s so much fun and everybody wants to talk with him. We’re there to have fun so we’re never on schedule when he comes on. But that’s the fun of it and I can’t say there is a Diva. Between us, I actually didn’t grow up reading Comics, as some of my Colleagues did. Probably shouldn’t say that but I remember when I walked into Marvel, there was about 20 people working there. Now we’ve grown to hundreds, but I remember the first time my boss brought me in to watch “Ironman” and I absolutely fell in love with the movie. I fell in love with the Character and I just knew — this is the company I want to be in business with. This is the type of movie I want to work on. And so from then on I grew to love it. I actually didn’t grow up in that world. Avengers: Infinity War is now available on digital and will be available on Blu-Ray & DVD on August 14th!